Over 80% of all recent armed conflicts have taken place in “biodiversity hotspots” — areas that are home to an especially high variety of living organisms. As war ravages areas with high biodiversity, it can have a profound environmental effect. Both war and the subsequent peace can hurt biodiversity by causing conversion of forest into cropland or fragmentation of forest habitats through the creation of new roads. One case study for the impact of conflict on biodiversity comes from recent political and armed conflict in Colombia. According to the United Nations Convention on Biological Diversity, Colombia is classified as a “megadiverse” country. The nation is home to more species of birds and orchids than any other country and ranks second in plant, butterfly, freshwater fish, and amphibian biodiversity. 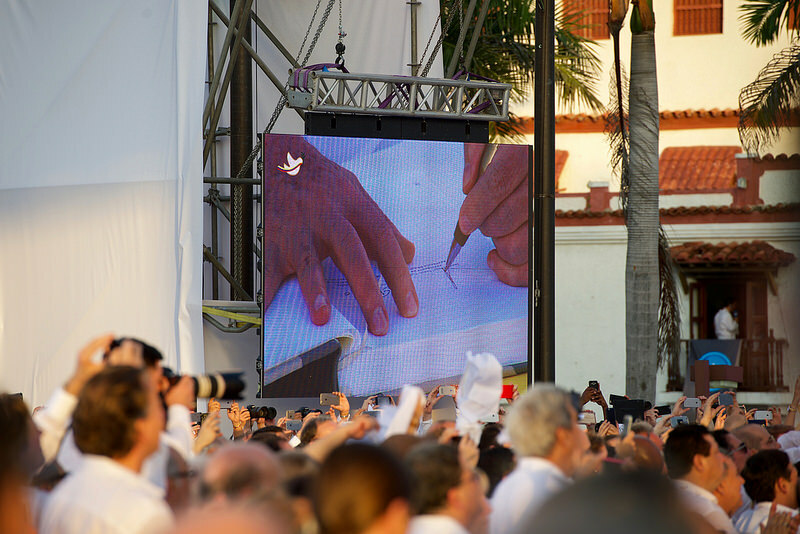 In 2016, the government of Colombia signed a peace agreement with the Fuerza Alternativa Revolucionaria del Común (FARC), bringing to an end over five decades of conflict. As the country begins to rebuild, peace will transform both the socioeconomic and physical landscape of the country. The decades-long conflict in Colombia had a unique “environmental” aspect to it, as guerrilla groups used language related to biodiversity and conservation to promote their agenda. In 1995, the FARC went so far as to prohibit any agriculture and hunting in the southern half of the Serranía de la Macarena. This policy was allegedly intended to preserve the beauty and integrity of the Colombian forests. In reality, it was likely motivated by the fact that these forests were home to the FARC headquarters. During the conflict, forests provided strategic cover from air raids and an invaluable source of water for rebel groups. Another rebel group, the Ejército de Liberación Nacional (ELN) protected areas of the Serranía de San Lucas using tactics that Dr. María Alvarez refers to as “gunpoint conservation.” Rebels placed landmines in forest areas in order to preserve the forest and protect water resources. Despite this environmental rhetoric, road building, illegal mining, and forest conversion during the conflict negatively impacted ecosystems throughout the country. During the conflict in Colombia, rebel presence in rural and forested areas led to forced migration from rural to urban areas. As conflict comes to an end, migration back out of over-crowded urban areas could lead to increased population pressure on rural land. Furthermore, new peace puts pressure on the government of Colombia for rapid economic development and reconstruction. Historically, forests have often been disregarded as governments focus on political and economic issues associated with ending a conflict. Development that involves the exploitation of natural resources (e.g. cattle ranching, mining, forest clearing) could have severe environmental and social consequences. In light of this analysis, Dr. Alejandro Salazar and colleagues propose several policy suggestions to preserve Colombia’s tremendous biodiversity and support some of the human populations that have been impacted by conflict. Salazar and colleagues suggest that the government should prioritize rural development in areas that have already been deforested, while also providing incentives for forest conservation. In doing so, they should focus on providing options for the most vulnerable human populations that have been affected by the conflict, including women and children, indigenous groups, poor rural communities, and people of African descent. On a local level, they suggest working with area residents to designate new protected areas. Through these policy solutions, the government would provide opportunities and rich environmental resources for future generations. Global climate change is already causing droughts and sea level rise that could increase the frequency of civil wars over the course of this century. The policies Colombia develops to protect its natural environment while recovering from decades of civil war will serve as an important model in dealing with the effects of future climate wars. As climate change causes increased conflict, we must not let conflict further exacerbate environmental damage.